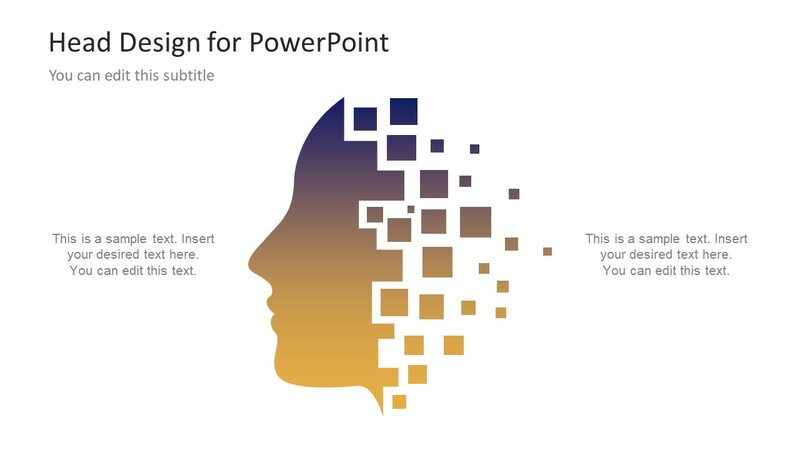 The Free Head Design for PowerPoint is an awesome digital design for technology presentations. The template is ideal for demonstrating range of concepts relevant to information technology. Such as, global networks, communication, artificial intelligence and more. 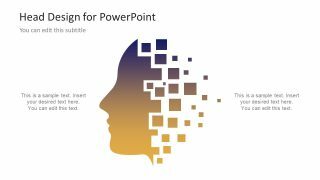 The free PowerPoint template contains human head silhouettes with a brilliant effect of phasing-out object. The shape of head presents the person’s ability to perform certain functions. Whereas, phasing out into small square bits here demonstrate the idea of advance technology taking over the world. 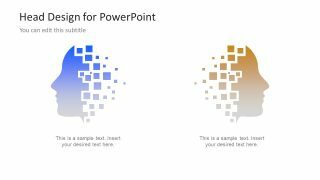 Therefore, these free PowerPoint shapes are useful for presenting how artificial intelligence is affect jobs and businesses. Similarly, it can also show illustrate the theory of how the advance information technology is changing the world. Also, explain the frequent innovations and modernizing lifestyle is affecting us in present. 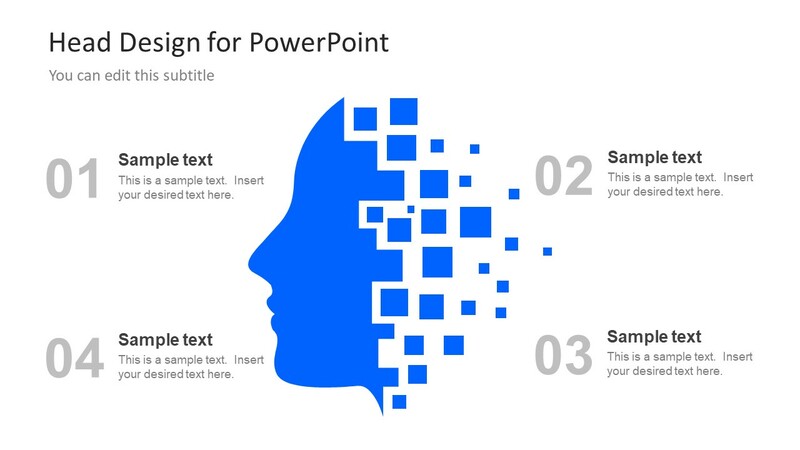 The Free Head Design for PowerPoint has set of useful shapes to present topics in various industries. For instance, mind mapping, data mining, communication and brain activity etc. The brilliant smart head design version of this outstanding template available for premium users of SlideModel. Although it is a free PowerPoint template of head silhouette design. It is also an editable slide desk with several customization options. The basic customizations include changing colors, size, position and backgrounds. 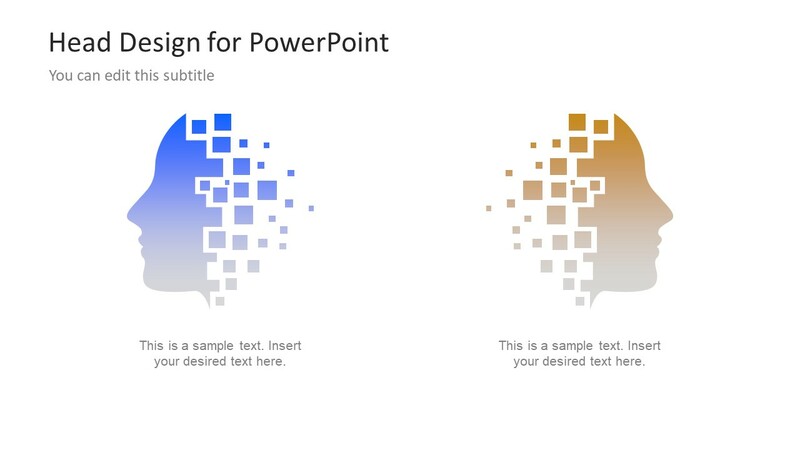 However, the PowerPoint offers more editing options like the gradients effect in head silhouette designs. Similarly, the other shape effects like 3D, shadow and reflection in drawing format menu. 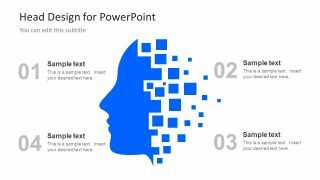 The free slides of human head PowerPoint silhouette design is resourceful tool for training and management presentations. Moreover, it aids as visual for mind, thinking and brain power topics in health care and personal motivation seminars. Additionally, the PowerPoint has a 4-step diagram with center as human brain. Each segment, has numbers to represent them with the title and descriptions. Furthermore, the shapes in PowerPoint are high resolution vectors. Hence, rescaling the objects does not affect the quality of image.